See Spot run. Spot's having fun...or is he? Just as running isn't the sport for everyone, it's not the sport for every dog. Even if your dog seems to love chasing things and running around the yard, that doesn't mean your pooch will take to running. The pros of a canine running partner can be numerous. Many runners say their dog enjoys running and helps keep them motivated – after all, you might be able to shrug off your human workout partner's teasing when you skip a workout, but it's tough to ignore the expectant look of a canine workout partner (or their cold nose against your skin, which is much more effective than an alarm clock!). It can be great exercise and, given our two- and four-legged populations' trend toward being overweight, it's pretty clear we all need more exercise. 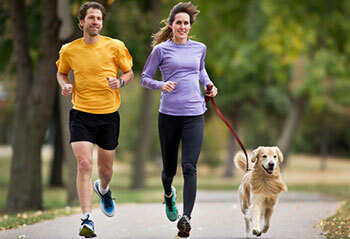 Running can also be a good bonding experience for both of you. That said, there is a downside to running with your canine companion. For one, running injuries aren't restricted to two-legged runners. Remember that you're most likely wearing well-padded shoes that provide support and cushion when you run, but your dog is barefoot. Being barefoot isn't that tough when a dog is running on grass or other natural ground surfaces, but running on concrete, asphalt, gravel or other hard surfaces can put a lot of stress on your dog's body and can put them at risk of injury to their legs, paws or paw pads. Your dog's breed (or predominant breed) may play a role, too. Keep in mind that a Husky or other breed with a thick hair coat might be much happier in cold weather and pretty miserable in the heat, but a short-coated dog such as a greyhound or whippet might need to wear a jacket to run in cooler weather. If you have a short-nosed (the technical term is "brachycephalic") dog, such as a pug, boxer, mastiff or bulldog (for a longer list, check out the Wikipedia entry), running may too risky. These dogs have abnormalities in their airways (especially the nose and throat) that make it harder for them to breathe when exerting themselves, and can increase their risk of heatstroke during warm weather. Consult your veterinarian before running with any short-nosed dog. Have you ever run in a fur coat? Your dog is doing it every time they run, so if you're feeling warm, your dog is feeling much warmer. Most importantly, dogs don't have the same cooling mechanisms we do - a dog's primary method of cooling is panting, and it's not as efficient as sweating. (Although dogs do have some sweat glands in their paw pads, they play little to no role in cooling off your dog, and certainly will not help when your dog is overheating.) Running with your dog during the hottest parts of the day is a recipe for potentially deadly heatstroke. In the winter, ice, snow and ice melting products can damage your dog's paws. If your dog has a short hair coat or is less tolerant of cold temperatures, you'll need to protect him/her with a coat. In severe cold, remember there is a risk of frostbite, especially on the ear tips. If your dog is overweight, running isn't the best way to start – talk to your veterinarian about a diet and gradual exercise program that begins with walks and gradually works up to running. Plan your route. Know where you're going, as well as places to take a break if you or your dog needs to cool off. If your dog must wear a jacket/coat while running in cool/cold weather, make sure the jacket fits well, doesn't have hanging straps that could tangle in your dog's legs, and doesn't interfere with your dog's leg movements, breathing, sight, hearing or ability to open his/her mouth. Check your dog's paw pads and legs after each running session for skin damage, swelling or pain. If you run in ice or snow, rinse your dog's feet (including the spaces between the toes and paw pads) thoroughly after each running session to make sure you've washed off the salt (and ice melter), and consider using paw protectors. Do you stretch before and/or after a run? Your dog might also benefit from this. Consider learning how to appropriately stretch your dog's legs.